Trying to predict traffic is like trying to predict the weather, which is to say, it’s basically an exercise in futility. Luckily, tools like Waze exist. Waze on Wednesday introduced an update to its iOS app called Planned Drives, which promises to “take the stress out of planning an appointment or important trip.” Basically, enter a destination and then hit the new Planned Drives icon (bottom lefthand corner). After that, enter in the time you’d like to arrive and Waze will tell you when you need to leave. It’s not unlike what you might get with other smart assistant services such as Google Now. What makes Planned Drives a little different is that, when choosing an arrival time, Waze will show peak traffic hours along your route, giving you an idea of when to leave (or when to travel); the feature will be especially helpful if you’re leaving on a road trip and don’t have a particular itinerary or ETA. And if you live in Southern California, like me, it’s pretty much never a good time to drive. 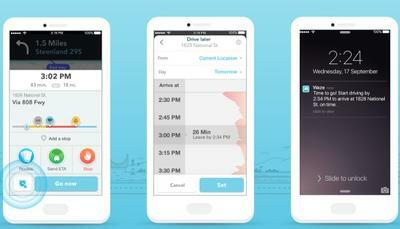 As part of the new feature, Waze says users will get the most out of Planned Drives by granting access to a calendar or Facebook account, along with enabling reminder capabilities in your phone’s settings. Planned Drives is now available for iOS (I used it this morning!) and will arrive on Android soon.